You have almost limitless options if you are looking for a hot tub enclosure for your inflatable hot tub. Not only will you be amazed the features that you can add to your spa experience, but you can also enhance your garden’s landscape and have more privacy while you lounge in your outdoor hot tub all day long. You are also protected from the sweltering weather or extreme cold so you can have fun and enjoy your home spa regardless of the season. Keep reading to find out our hot tub enclosure ideas for your ultimate enjoyment of your prized hot tub gazebo, whether it’s an open or completely closed gazebo that suits your needs. For your convenience, you do not need to hire an electrician or carpenter to set up your vey own hot tub enclosure. You can set up your own tub enclosure all by yourself since many come with hot tub enclosure kits with simple, step-by-step instructions. They include wall panels, windows, doors and all the accessories and hardware that you have to use in order to construct the enclosure. Feel free to seek help from a family member or a friendly neighbor so you can have the hot tub up and ready in a matter of hours. Although almost everything is included in hot tub enclosure plans, you need to have a level floor with a solid surface on which to assemble your enclosure. Even small hot tubs are considerably heavy when filled with water so the floor should be able to withstand the water volume. The floor also has to bear the weight of the roof and walls of the tub enclosure. Hot tubs and spas with open air facility or Jacuzzi can be upgraded into lattice walls with artificial plants or greenery. They come with seamlessly fitted panels on each side of the tub. When you measure the dimensions of the enclosure against the perimeter of the tub, make sure that there is sufficient room for you to circle the hot tub to entertain your guests. This enclosure is commonly open at the top so you can just lay back, relax, and watch the canopy of stars above with your special someone in your 2-person hot tub. Unless it’s an indoor hot tub, you have to have plans on how to protect yourself from the heat of the sun during the day! You can convert your open tub enclosure into a pavilion with a roof but without walls. The enclosure holds the corners of the pavilion. If privacy is your concern, you can add screen shields that you can easily open and close as you desire. Among hot tub prices, this is one of the practical way to put up a hot tub gazebo since you don’t have to pay for additional costs in mounting walls and windows. Of course, it is optional to install screens and windows. 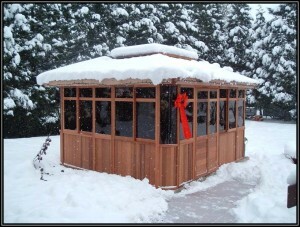 You may be planning to use your hot tub gazebo with family and friends or all alone with your special someone. Whatever the purpose is, you need a hot tub enclosure that offers flexibility. If you need total privacy, go for an enclosed spa enclosure that shields you from the curious eyes of your neighbors and passersby. If privacy is not a huge concern for you considering that you have kids and grandchildren walking in on you, then an outdoor portable hot tub with an open enclosure is just perfect, not to mention it saves you money. 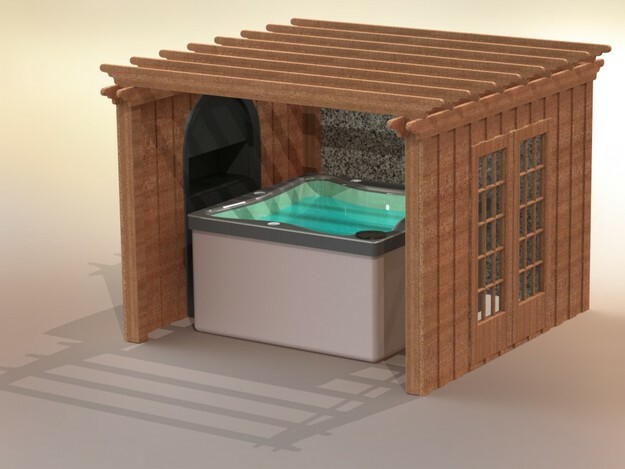 This entry was posted in hot tub reviews, spa, ways to relax and tagged hot tub parts, hot tub reviews, luxury spas, Portable hot tub. Bookmark the permalink.